"I have been looking for an interest tracking program for 20 years. I’ve even tried to develop my own. Finally someone has gotten the job done with a quality, feature rich product at a very fair price, making it accessible to every Seventh-day Adventist church in North America." "Disciples is by far the most comprehensive, yet intuitive, interest-tracking software. It's one of the best organizational tools I use as a Bible worker." Quick, at-a-glance overview of your interest database and easy access to what you're looking for. Need to find a certain name or limit your report to certain records? Smart filters make searching easy. Manage and track attendance for all your evangelistic, health, family, and member training events. Track all the information that's most relevant to you. Those important details will always be a click away. Intuitive, familiar interface makes Disciples simple and convenient. Quickly sort through thousands of records to find just the ones you're looking for. Keep track of all the churches in your district	or all the sites in your evangelistic program. Schedule upcoming appointments and record past ones. Never forget a visit again! Allow multiple users to access your data. Specifiy access permissions per user. Take event attendance painlessly using any compatible USB barcode scanner. Use the included templates, or create your own. 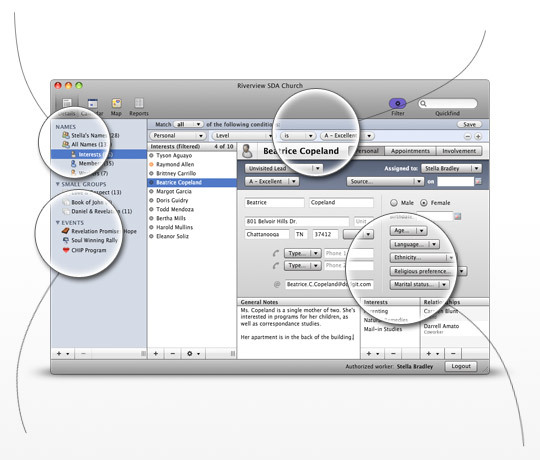 Save as a PDF, export to CSV, or print out a hard copy.